T-Mobile has done a great job in keeping the myTouch line of Android devices relevant and fresh. Going back to last year with the first generation myTouch, to the myTouch Slide, and now to the new myTouch 4G. 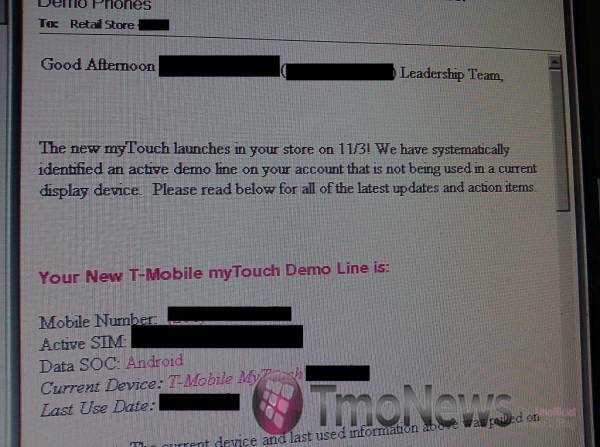 A leaked internal email obtained by TmoNews clearly shows that the new myTouch device will be launched on 11/3. There has been tons of debate on what T-Mobile will be calling the newest myTouch handset. Originally thought to be the myTouch HD, although some tests units have been reported as saying “myTouch 4G” on the bootscreen. But T-mobile has been referring to it as the “new myTouch”. Either way whatever they decide to call it, T-Mobile has a busy day planned for November 3rd. Along with this new myTouch, T-Mobile has the release of the LG Optimus T and the Motorola DEFY, both of which are entry-level Android phones, on that day also. Not only that but T-Mobile’s revamped data plan goes into effect on November 3rd. Busy day! Android 2.2 Froyo OTA Update for T-Mobile MyTouch 3G Has Begun!